by Jeffrey A. Carver Author · Jeffrey A. Carver Author of afterword, colophon, etc. 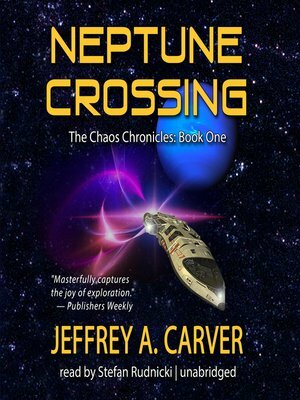 The first installment in the thrilling, action-packed Chaos ChroniclesWhen John Bandicut sets out across the surface of Triton, he's hardly ready for the storm of chaos that's about to blow through his life. The alien Quarx that soon inhabits his mind is humanity's first contact with an alien life. The Quarx, part of an ancient galactic civilization that manipulates chaos theory to predict catastrophic events, seeks to prevent a cometary collision that could destroy the Earth. But it must have help. If Bandicut chooses to trust the Quarx, he must break all the rules—indeed, sacrifice his life as he knows it—to prevent humanity's greatest cataclysm. Leaving friends and lover behind, hurtling across the solar system in a stolen spaceship, Bandicut can only pray that his actions will save the Earth—even if he doesn't live to see it again. Jeffrey A. Carver's most recent novel, Eternity's End, was a finalist for the Nebula Award. He has written more than a dozen novels, including his critically acclaimed novelization of Battlestar Galactica. He lives in Arlington, Massachusetts.